Cinnamon is a spice derived from the inner bark of several species of cinnamon trees. The two most common varieties are Ceylon and cassia. While they offer different chemical constituents, both types are considered a valuable herbal substance known for their unique flavor, warming qualities and uplifting fragrance. The delicious taste of cinnamon has made it a popular culinary spice used among many cultures worldwide, however, it is also prized for its tonic-like effects and subtle yet powerful qualities as a natural energy and circulatory stimulant. Cinnamon trees grow in tropical and subtropical climate zones and are indigenous to regions of China, Indonesia and Sri Lanka. It was consequently one of the first commodities exchanged along historic spice trade routes and distributed among civilizations of Asia, Northeast Africa and Europe. 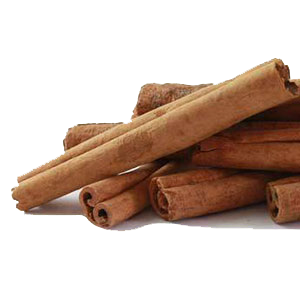 Used therapeutically throughout China and India, cinnamon is a multipurpose herb providing numerous health enhancing properties most notably helpful for the digestive, respiratory and circulatory systems. A variety of cassia cinnamon, known as "Chinese cinnamon", is one of the highly revered major herbs in Chinese herbalism. Cassia variations, in addition, to Ceylon selections, are similarly a traditionally used Ayurvedic herb as well as a renowned Indian food and beverage flavoring. The characteristic flavor and fragrant smell of cinnamon comes from one of the main essential oils found in the bark called cinnamaldehyde. This is one of the primary active components responsible for many of its actions as a circulatory aid, anti-inflammatory and potent antibacterial compound. Its pungent acrid taste and hot penetrating nature provides benefits to the digestive system, increasing "digestive fire", relieving abdominal pain and clearing excess mucus from the body. Cinnamon is soothing to the stomach and activating to the blood, offering a complimentary balance of both demulcent and warming qualities. 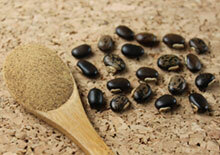 This attribute helps to prevent drying of the tissues, which can sometimes occur when using hot spices. Cinnamon is a well-known ingredient in chai tea blends and similarly assists in buffering the heating qualities of other herbs customarily used. It is one of the top non-caffeinated herbal stimulants widely incorporated into many tea formulations for its energizing effects and activating influence on other herbal roots, barks, leaves and berries. Most people, after drinking a cup of cinnamon tea, will notice greater mental alertness, liveliness or what some herbalists refer to as the "inner tingle." It is most popular in scientific literature for use by diabetics due to its ability to regulate blood sugar levels and improve efficient response to insulin. 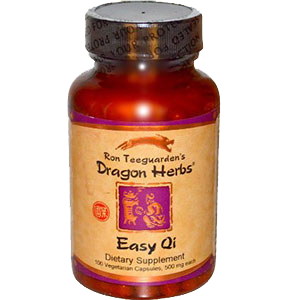 Likewise, it is considered beneficial for the cardiovascular system and is a supportive herbal substance for healthy blood pressure and maintaining balanced cholesterol levels. Cinnamon is frequently used as a tea sweetened with honey for a number of acute conditions such as colds, influenza and feverish conditions. It is considered by most herbalists to exhibit cleansing properties as a blood "alterative." Small amounts of cinnamon consumed as a tea infusion are helpful for improving complexion and dispersing tension or energy blocks in the neck and shoulders. There is some debate about the toxicity of cassia cinnamon because of its higher amounts of coumarin content, which can potentially cause damage to the liver when used over an extended period of time. These side-effects, however, are usually only relevant when consuming a very large dose of cassia cinnamon powder. This can occur when taking high quantities on a regular basis, especially in the form of a dietary supplement. Cinnamon comes from the bark of several species of low growing tropical evergreen trees in the genus Cinnamomum, all of which are members of the large Lauraceae family of plants, distantly related to species like sassafras, camphor, bay and avocado. The name Cinnamomum comes from the Greek word 'kinnamon' which means "sweet wood." Although the inner bark is the most frequently utilized resource extracted from the trunk itself, the leaves, twigs and blossoms are also useful as they contain similar aromatic oils and medicinal compounds. Cinnamon sticks are not natural branches of the tree, but are created when the bark is stripped. It can be harvested in several different ways. One Ceylon procedure involves cutting down the trunk, dividing it into logs, removing the outer bark and slicing strips from the inner bark layer, located just underneath the exterior bark surface. Another way to harvest cassia varieties entails extracting large pieces of the bark, similar to eucommia bark harvesting. This allows the tree to continue to produce future bark layers, but will eventually destroy the tree. The woody strips collected are a light pink-cream color and darken as it oxidizes, rapidly developing a red-brown pigment. These strips also naturally curl when dried, rolling up into a tight tubular form known as a "quill" or the common cinnamon stick. Chinese cinnamon is often harvested with the exterior bark attached and sold in thick large pieces rather than curled up sticks. Cinnamon tree cultivation is somewhat sustainable, as the trees grow back rapidly when cut. This is because after the root system of the tree is established, new shoots will easily propagate from the trunk base and grow new cinnamon trees quite rapidly in tropical climates. There is, in fact, some evidence of cultivated root systems dating back to historic civilizations of the spice trade. The main species produced for commercial use include Cinnamomum verum, Cinnamomum burmannii and Cinnamomum cassia. Although Cinnamomum verum, also called Ceylon cinnamon, is often considered to be "true cinnamon", most cinnamon in international trade commerce is derived from the related "cassia" species. Ceylon is less popular and harder to find than cassia, with Indonesian Cinnamomum burmannii being the predominant cinnamon retailed to the worldwide market. Chinese cassia twig, called Gui Zhi, is also frequently used and sold as "cinnamon twigs" or "cassia twigs." These types are typically available in slices as they are not extracted from the inner bark, but from the smaller tree branches. 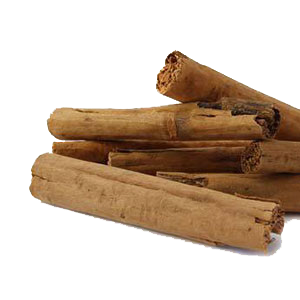 Classified under the latin name Ramulus Cinnamomi, cinnamon twig is a very common ingredient in Chinese tonic herbal blends and patent formulas. 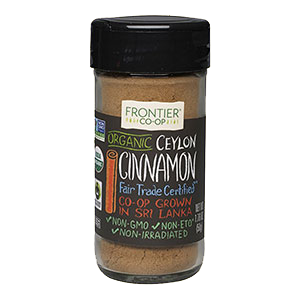 While there is only one main variety of Ceylon cinnamon (Cinnamomum verum), with a few different cultivars, there are several known species of cinnamon generically referred to as "cassia" cinnamon. Chinese and Indonesian cinnamon barks are frequently both called Chinese cinnamon or identified as the same variety, although they come from different species with slightly differing characteristics. Indonesian, the most common variation sold commercially comes from regions like Sumatra and is less sweet with higher amounts of coumarin than Chinese cassia. It is consequently lower in price. The main one referred to as "Chinese cinnamon" is Cinnamomum cassia. 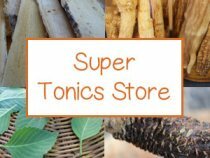 This species is classified as a major tonic in Chinese herbalism, frequently used in the form of a bark or twigs, in herbal preparations with adaptogens like ginseng, poria, peony, dendrobium, licorice and many others. 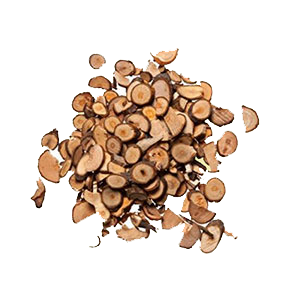 Chinese cinnamon bark is graded according to its age and thickness. It is normally sold as whole pieces and less often as a tubular stick, depending on harvesting procedure. Premium grades are highly valued and considerably more expensive than those of a lesser quality derived from younger trees. 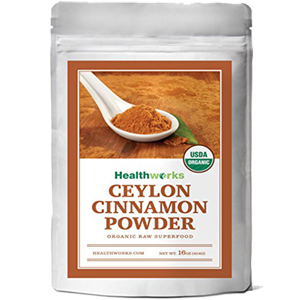 Ceylon cinnamon (Cinnamomum verum or Cinnamomum zeylanicum) is native to southern India and specifically the island Sri Lanka located off the southeastern tip of India. 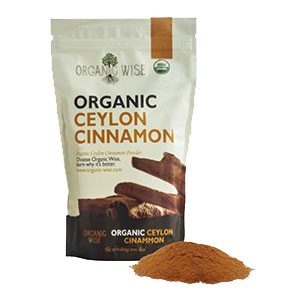 Sri Lanka was formerly known as Ceylon before 1972 and is where this type of cinnamon gets is name. This is also where Ceylon tea originates, a cultivar of the Camellia sinesis species. While it is still extensively cultivated in Sri Lanka, it has also been introduced to Madagascar, Brazil, Mexico, Central America and the Caribbean for commercial propagation. The word "verum", from its scientific name Cinnamomum verum, is Latin for the word "true." This is one of the reasons it was originally referred to as "true cinnamon." Today this name is sometimes manipulated as a marketing device to indicate superiority over cassia variations. Ceylon is typically more expensive than cassia because it is sweeter and less pungent tasting. 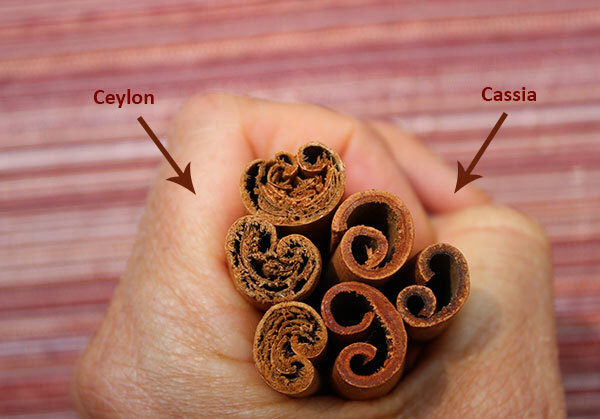 Ceylon cinnamon sticks or "quills" are graded in Sri Lanka according to their diameter, which varies between 0.24 in (6 mm) - 1.3 in (33 mm). There are also about seven different cultivars that are identified by the taste of the bark. 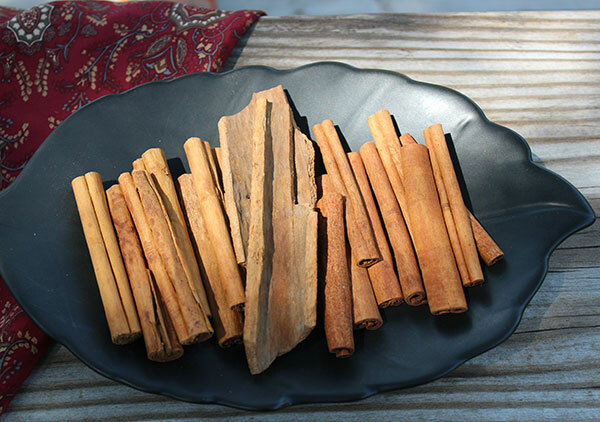 Cassia cinnamon types are a darker red-brown color, stronger tasting and produce a single-layered thick, hard bark that is difficult, if not impossible, to crush by hand. They are also known to contain a higher amount of volatile oil content as well as the compound coumarin. The Ceylon species is composed of a softer thin bark with multiple layers that are easy to break. 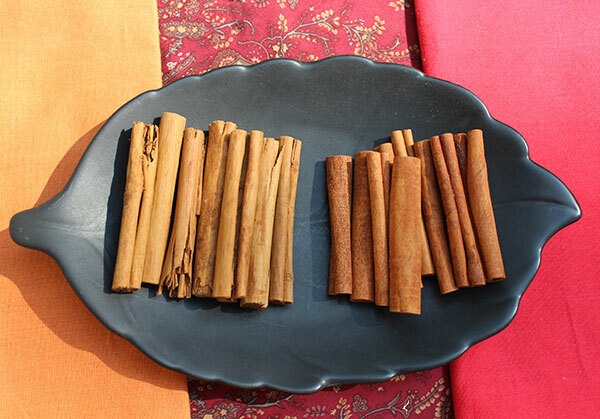 It is often called "sweet cinnamon" because it has a sweeter less pungent flavor compared to cassia varieties. The bark, whether in stick or powdered form, is usually a lighter red-brown color. 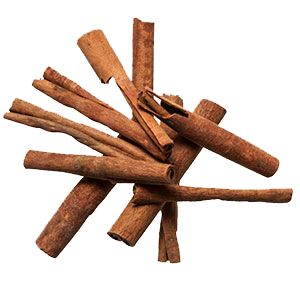 While both types of cinnamon have been found to have health benefits, cassia is known to contain more coumarin content. 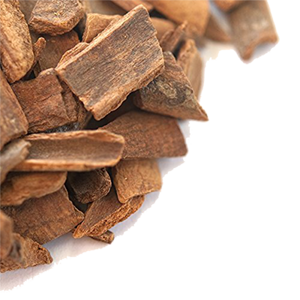 Coumarin is a natural plant substance and aromatic compound that is especially high in two main foods: cassia cinnamon and tonka beans. 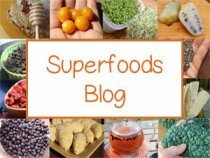 It is also found in a number of other foods, herbs and superfoods like celery, chamomile, green tea, clover, reishi and noni in lower amounts. Coumarins exhibit anti-inflammatory actions and also possess strong anticoagulant properties and are thus the bioactive constituents found in certain medical drugs. For instance, the drug known as "Warfarin" or "Coumadin", is synthetically derived from dicoumarol (a derivative of coumarin) and is a frequently prescribed blood thinning medication. While in small quantities coumarin can be a health promoting substance, it has also been demonstrated in some studies to have hepatotoxic effects when consumed in high doses. Coumarin is moderately toxic to the liver and kidneys and has a median lethal dose of 275 mg/kg, which is a low toxicity level in relationship to other compounds, but not something you want to consume in large amounts. The average cassia dose when consumed as a tea or spice is usually fairly low. However, when used as a concentrated flavored extract ingredient in various commercial foodstuffs or as a dietary supplement, these levels can go beyond the recommended safety precautions. In one study published in The Scientific World Journal it was identified that "Cassia cinnamon contains up to 1% coumarin, whereas true cinnamon contains only a trace, about 0.004%." The U.S. Department of Health recommends that most people should not consume more than 6 grams (a little over one teaspoon) of cassia powder daily for more than a 6 week period. (*) While coumarin levels in different cassia varieties may vary, generally the safe daily dosage range suggested is between 1/2 a teaspoon once or twice daily. In other research reported in the Journal of Agricultural Food Chemistry, analyzing coumarin levels in various cinnamon species, it was identified that Ceylon and Chinese cinnamon had substantially less coumarin content than Indonesian and Vietnamese types. For those of you sensitive to coumarin intake or the harsher more overpowering flavor of cassia cinnamon, Ceylon might provide a better alternative. 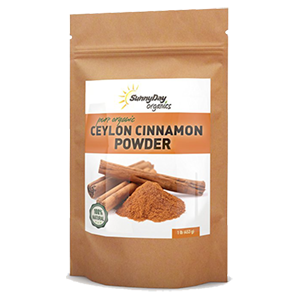 Another suitable option, if you'd like to receive the benefits of both Ceylon and cassia, is to use a combination of both powders or try a 3:1 ratio of ground Ceylon to Indonesian cassia. Cinnamon is one of the natural herbal stimulants, in the same category as other herbs and spices, like cloves, ginger, peppermint and coriander. A cup of cinnamon tea can be a nice mid-day "pick-me-up" for preventing fatigue, boosting the mood and increasing mental alertness. 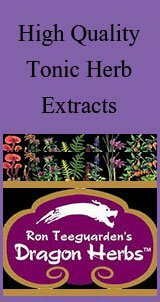 The stimulating qualities of powders, twigs, chips, pieces and sticks, when added to herbal tea preparations, additionally act as catalysts for the transport of the primary and supportive herbs, assisting in their assimilation. Chinese cinnamon, Cinnamomum cassia (C. aromaticum), is native to China where it has been used extensively as an herbal ingredient in many patent and tonic formulations. Cinnamon bark and twig is regarded as a Yang tonic, especially relevant to kidney Yang. Yang herbs invigorate Jing essence and are rejuvenating to the reproductive system and help to clear cold damp conditions. Also called Rou Gui, its hot energy and sweet pungent taste promotes good circulation, "allowing for Chi to freely circulate." Its warming attributes strengthen kidney Yang and is likewise considered a mild sexual tonic, commonly used with other libido enhancing herbs like ginseng, schizandra, cordyceps, tongkat ali and cistanche. Cinnamon has an upward moving dynamic that helps to relieve tension and diffuses blocked energy in the upper body, particularly the shoulder and neck region. It is also known to be helpful for improving skin quality and clearing the face of blemishes. 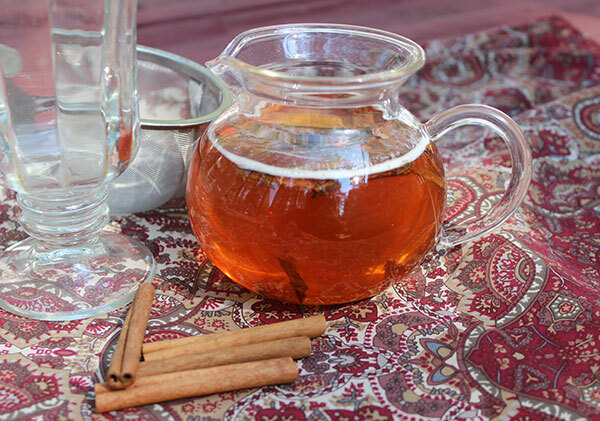 Drinking cinnamon tea is excellent for the elderly when experiencing cold or dampness. It is especially known to warm the extremities and provide analgesic actions that can be helpful for relieving arthritis in the joints. Known in Sanskrit as "tvak" (which means "skin") and in Hindi as "dalchini", cinnamon has a long history of use in Ayurvedic herbal therapies. Again, it's hot and penetrating qualities are typically used for dispersing cold and stagnant conditions. Cinnamon is an appropriate Ayurvedic herb for both Vata and Kapha body types or doshas, but not those with excess Pitta (heat) unless balanced with other cooling herbs or foods. 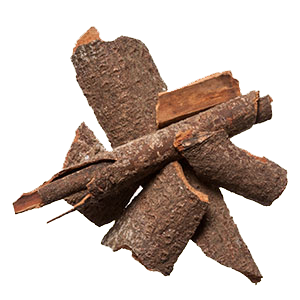 Tvak is a multipurpose medicinal bark which primarily supports digestive, respiratory and circulatory functions. Cinnamon's warming qualities are complimented by its somewhat demulcent nature which is soothing to dry conditions and healing to the gastrointestinal tract. When consumed as a tea, this attribute is known to coat and sooth the throat as well as help expectorate any thick mucus that may adhere to bronchial passages. This demulcent (gooey) characteristic becomes quite evident when you infuse the cinnamon powder directly in hot water. The tea will, after a few minutes, form a thick mucilaginous clump on the bottom of your tea cup. Using cinnamon as a tea or spice seasoning can be helpful for stimulating the appetite, increasing digestive fire, alleviating indigestion as well as PMS, bloating and flatulence. 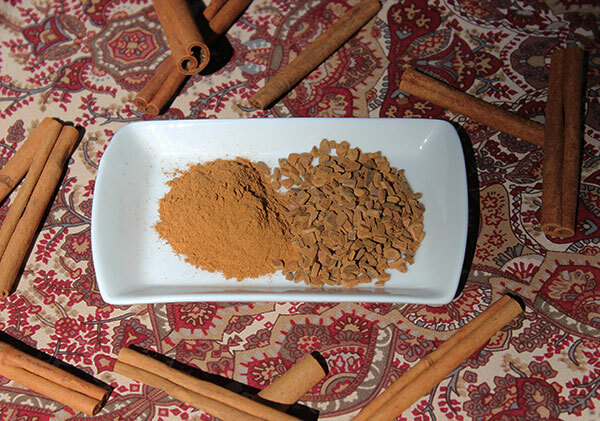 Indonesian and Ceylon cinnamon is widely consumed in East Indian cuisine in curries, as a component of garam masala, and in chai tea blends. Many of cinnamon barks unique health enhancing features come from its volatile oil content and the main active compounds namely cinnamaldehyde, cinnamyl acetate, cinnamic acid, eugenol and cinnamyl alcohol. These compounds support the use of cinnamon for improving antioxidant levels and inhibiting bacterial, viral and fungal infections. Cinnamaldehyde, also called cinnamic aldehyde, makes up the greatest percentage of total oil content in the bark and, along with eugenol, is one of the main active antibacterial components. In one 2016 published study, it was shown that cinnamon can potentially increase enzymatic antioxidants, observing that "administration of cinnamon to diabetic patients for 12 weeks resulted in significant elevation of superoxide dismutase level" and was also demonstrated to "increase the level of serum glutathione." In a comprehensive 2015 review, analyzing the scientific data accumulated over the previous 5 years regarding the antibacterial properties of cinnamon and the active compounds, it was suggested that cinnamon might serve as an "alternative to synthetic antibiotics, especially for the treatment of antibiotic-resistant bacterial infections." In the same publication it was identified to have a high antibacterial activity in response to human infectious diseases. Cinnamon oil extracts have likewise been shown to be helpful for candida infections and the barks can be ingested as cinnamon tea or as a powdered spice for such conditions. 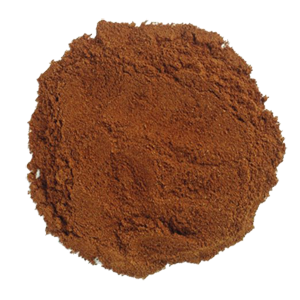 A commonly used herbal extract in the cosmetic and pharmaceutical industries, cinnamon helps to increase the shelf life and microbial safety of skin and food products. Cinnamaldehyde is also utilized as a natural fungicide applied in alternative agriculture because of its low toxicity levels compared to synthetic alternatives. Cinnamon powders, teas and dietary supplements are very popular for their effects at regulating blood sugar, improving insulin response and lowering serum lipids. They have thus been well-studied as dietary adjuncts for those with type 2 diabetes and cardiovascular disease. Valued as a common East Indian culinary spice, some research indicates that cinnamon helps to reduce blood sugar spikes by slowing the digestion of foods in the stomach. The phytochemical constituents in cinnamon have been specifically shown to prevent the development of insulin resistance and improve insulin sensitivity and glucose transport. In a review documented in the journal Complimentary & Alternative Medicine, analyzing studies on Ceylon or "true cinnamon", it stated that "The available in-vitro and in-vivo evidence suggests that CZ [Cinnamomum zeylanicum] has anti-microbial, anti-parasitic, anti-oxidant and free radical scavenging properties. In addition CZ seems to lower blood glucose, serum cholesterol and blood pressure, suggesting beneficial cardiovascular effects." It is also recognized, however, that there is a varying degree of possible influences which may be largely dependent on unique health conditions, intake of prescribed drugs as well as type, duration and amount of cinnamon dosage. This is evidenced by some studies revealing contrasting results when using cinnamon as a dietary supplement, showing little to no change, especially on diabetic patients observed. Although using cinnamon as a tea or spice ingredient, along with a regular exercise routine and a health promoting diet, might be of benefit to those with type 2 diabetes and related conditions, it is best to consult your medical physician especially if you are taking prescription medications or have extreme health issues. Because cassia cinnamon, when taken as a dietary supplement, can exceed toxicity levels for coumarin content, it is generally recommended that you stay within the safety zone of well below 6 grams, taking a break after about 4 to 6 weeks. As we mentioned, the suggested therapeutic dosage is 1/2 teaspoon consumed once or twice daily. This advised amount can fluctuate however depending on one's individual body weight and other factors. In some scientific research, cinnamon with its anti-inflammatory activities and proanthocyanidin compounds, has been reported to offer health benefits to those with neurological disorders and impaired cognitive functions. Proanthocyanidin phenols have been shown in studies to inhibit glycation offering protective effects for not only those with diabetes but also Alzheimer's disease, now often referred to as "type 3 diabetes." Cinnamon has also been shown in research to "inhibit tau aggregation associated with Alzheimer's disease and blocks cell swelling associated with strokes." Sticks - The whole quill or rolled inner bark layer. 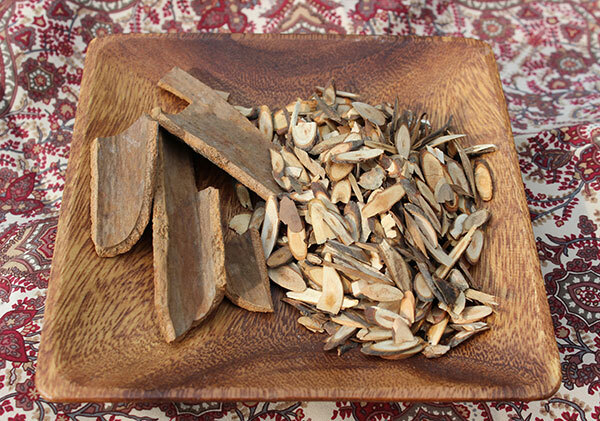 Pieces - Thick Chinese cinnamon varieties or thin Indonesian cassia or Ceylon quill pieces. Twigs - Slices or pieces of small cinnamon tree twigs rather than the trunk layer. 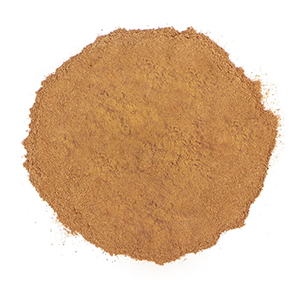 Powder - Created from blending the dried inner bark layer. Chips - Trimmings of the bark quills or sticks. Essential Oil - Usually extracted from cinnamon leaves as opposed to the bark. Because of its pleasant flavor, cinnamon powder is an easy ingredient to add as an accent to many types of foods, desserts and drinks. There are countless traditional and cultural dishes which incorporate this popular twig or bark-based spice. 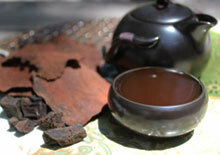 For therapeutic use as a digestive aid it is particularly delicious and effective when prepared as a tea. 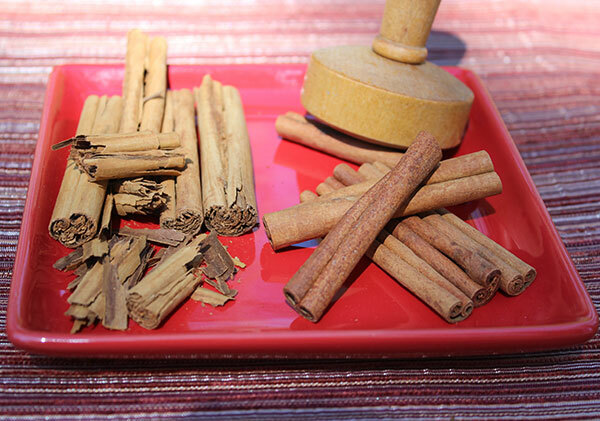 Cinnamon sticks, barks or powder can be infused in hot water, but should never be boiled for more than a few minutes. It is therefore usually infused into simmered herbal teas at the end of the brewing time. 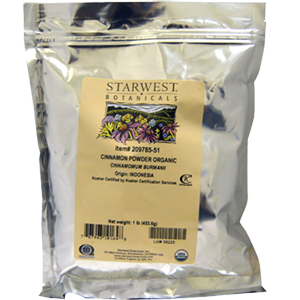 Cinnamon works very well as an adjunct to other herbal tonics and is commonly added to tea decoctions which may include other roots, barks and herbs like ginseng, dendrobium (suk gok), bupleurum, poria, peony, jujube dates, rehmannia, dioscoria and licorice. Most varieties are quite potent and thus only require small amounts in teas or as a spice ingredient. 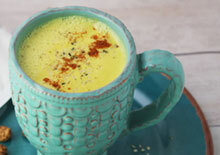 One of the keys to using cinnamon powder is the freshness. We typically recommend purchasing cinnamon sticks whole in bulk quantities. This will enable you to store it for a longer period of time and, more importantly, will allow you to create freshly ground powders from the whole sticks. 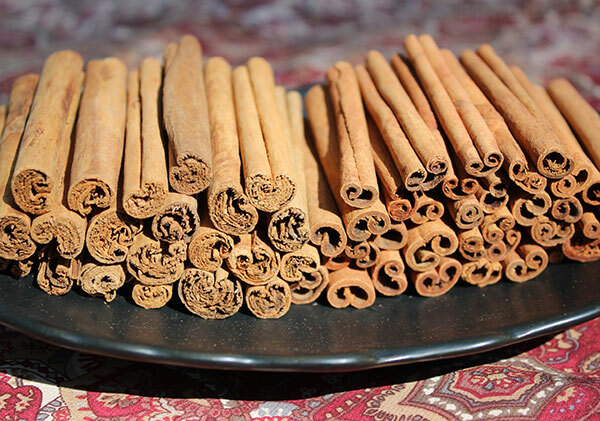 While Ceylon varieties grind up relatively easily, cassia cinnamon sticks require the use of a high-speed blending device or grinder to create a fine powder. 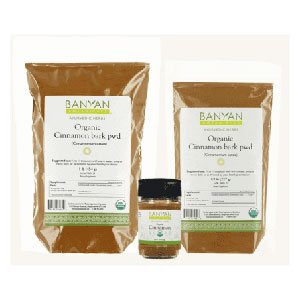 Mountain Rose Herbs and Banyan Botanicals are both excellent organic online sources providing either whole sticks, chips or powders. 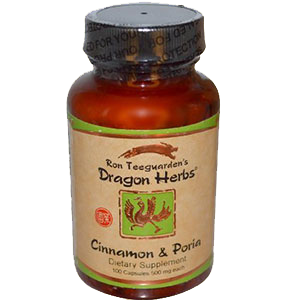 The brands Dragon Herbs and Jing Herbs both offer cinnamon in blended encapsulated formulas with poria and other herbs for use as a circulatory supplement. 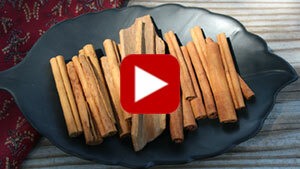 Cinnamon should be avoided by pregnant women because of its stimulating effects. 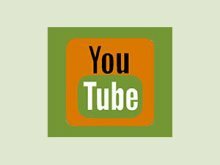 Consult the advice of a medical doctor or healthcare practitioner when taking therapeutic doses if you are diabetic or are taking prescribed medications, especially blood thinners. Avoid daily consumption of cassia cinnamon, particularly in the form of a dietary supplement, if you are sensitive to coumarin or have liver disease or inflammatory liver disorders. Avoid high amounts of straight cinnamon if you are predominantly a Pitta body type.